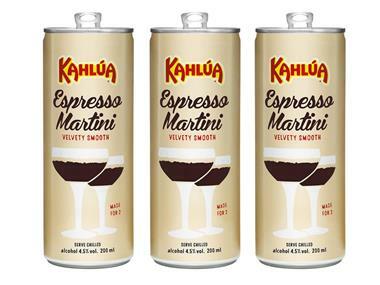 Kahlúa has released an RTD Expresso Martini can in smart nitrogen widget packaging across six global markets. This is the first of its kind from the company and was designed to take the confusion out of making the tricky-to-master cocktail at home. Focusing on the RTD cocktail industry, the can is designed for two servings with ingredients including roasted coffee, Kahlúa liqueur and grain vodka. The RTD comes in two versions, 4.5 percent ABV and 7% ABV. To create the Expresso Martini creamy foam, smart nitrogen widget pushes bubbles to the top as the can is opened. This development comes at a time where coffee culture in increasing worldwide and as more people make cocktails at home. “We developed the Kahlúa Expresso Martini can to tap into this emerging opportunity,” said Colin Kavanagh, VP, global marketing, Malibu & Kahlúa.